failure which left hundreds of rail passengers trapped in cramped, sweltering carriages for hours on the hottest day of the year so far. Temperatures had soared beyond 30 degrees inside the packed carriages – including one train which was stopped in its tracks in a tunnel. Track operator Network Rail has launched an investigation but admitted that many of the overhead cables had not been changed since the 1960s and were in need of repair. A spokesman for Network Rail said: “Some of the overhead lines are quite old. Most of them haven’t been updated since the 1960s – the lines are not that reliable. Commuters were stuck in the Belsize Tunnel – near Kentish Town – for more than three hours before they were freed by fire crews. They had to walk down the tunnel and along the track to be picked up by a special diesel train. They were then taken to West Hampstead, where paramedics were on hand to treat them for dehydration. Thousand across the country were hit by the travel chaos. All four East Midlands and Thameslink lines were closed throughout the afternoon, with fast trains cancelled throughout the rush hour. Normal service only resumed yesterday morning (Wednesday). Describing their ordeal, exhausted passengers painted a picture of anger and confusion. Maureen Scarlett said she missed an important meeting, adding: “I can’t tell you how angry I am. Trent Loveday, 25, who lives in Russell Square, had been coming back from Nottingham when the delays struck. His journey took four hours longer than usual. He said: “A lot of people were upset. “An hour in we were told the train was cancelled. They put us on a smaller, older train with no air conditioning. “It was hot and a lot of people didn’t get seats. We got held at a station for 45 minutes, then that train got cancelled and they put us on another small old train. 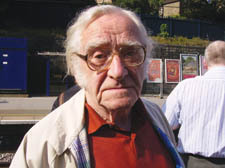 Pensioner Reginald Pike, on his way from St Pancras to St Albans, was in one of the stalled trains near Kentish Town. He said: “For hours we couldn’t get off the train because of the wires on the track. “When we got out, no one knew what was happening. It was very unpleasant. Shelley Atlas, chairwoman of the Brighton Line Commuters group, said: “We’re concerned to hear about people stuck in the tunnels. It’s awful.